NOTE: Please note this is a TV Cover. Flat screen television is not included. Measure TV screen for proper fitting. The Pawtec Lightweight Flat Screen TV Full Body Sleeve Cover is Pawtec's original unique design to protect your valuable TV and keep your brand new flat screen television looking like the day you bought it. Our sleeve protects your flat screen TV from dust and dirt when not in use, and is designed to look good in any home or office. Made from lightweight and stretchable brushed lycra material, the Lightweight Flat Screen TV Sleeve fits a large variety of TVs from many popular brands and can fold and store away easily when not needed. This lightweight sleeve fully covers your flat screen TV and features a unique cutout backing that allows you to put on and take off the sleeve without needing to remove cables attached to the back. The interior of the sleeve is soft lined to prevent scratches to the screen when removing or placing the cover. Our TV cover fits major brands such as LG, Samsung, Sony, Vizio, Philips, Panasonic, Sharp, Toshiba, and more. Sleeve cover measures 60" in width and 35" in height. Screen sizes within this range will fit. - Easy to install, just slip over the TV. - Easy to fold and store away when not needed. - Back opening allows sleeve to slip on or off without removing cables attached to the back of the TV. - Soft lined interior protects the screen from scratches. - Flat Screen TV Lycra Full Body Sleeve for 65 inch TVs. - Measures 60-inch x 35-inch. 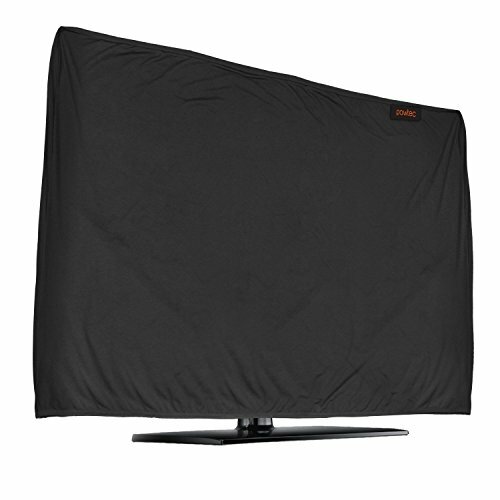 This Lightweight TV cover protects 65 inch flat screen televisions from dust and dirt when not in use or when being transported. Made from top quality stretchable and lightweight brushed lycra material for easy handling and storage. Inside has soft lining to prevent scratches to the TV screen. Cutout backing design allows you to fit TVs of various thickness and fit cables attached to the TV. TV Cover fits all kinds of flat screen TVs from brands such as LG, Samsung, Sony, Vizio, Philips, Panasonic, Sharp, Toshiba, and more. Easy and convenient to put on and take off. Pawtec is the original designer of the Lightweight Full Body TV Sleeve, our design team uses cutting edge, high quality materials to keep your TV stylish and protected. This product comes with a one-year limited warranty with easy customer service support. If you have any questions about this product by Pawtec, contact us by completing and submitting the form below. If you are looking for a specif part number, please include it with your message.